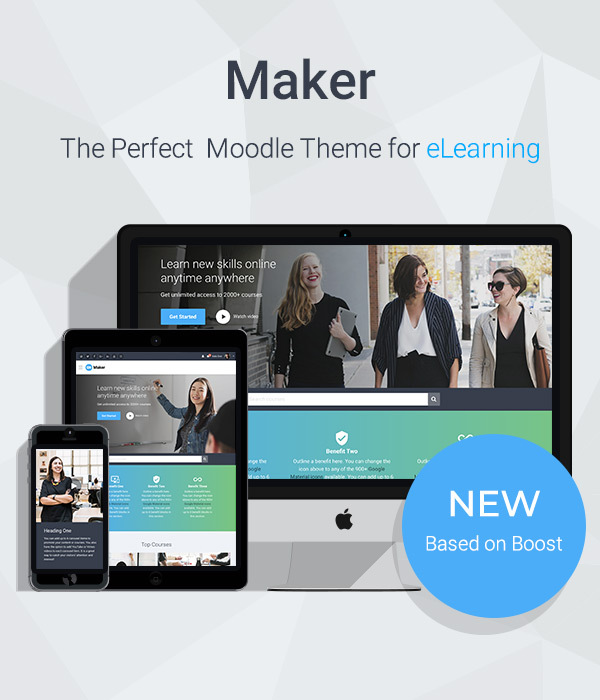 We are excited to announce the release of a new Moodle theme “Maker“. 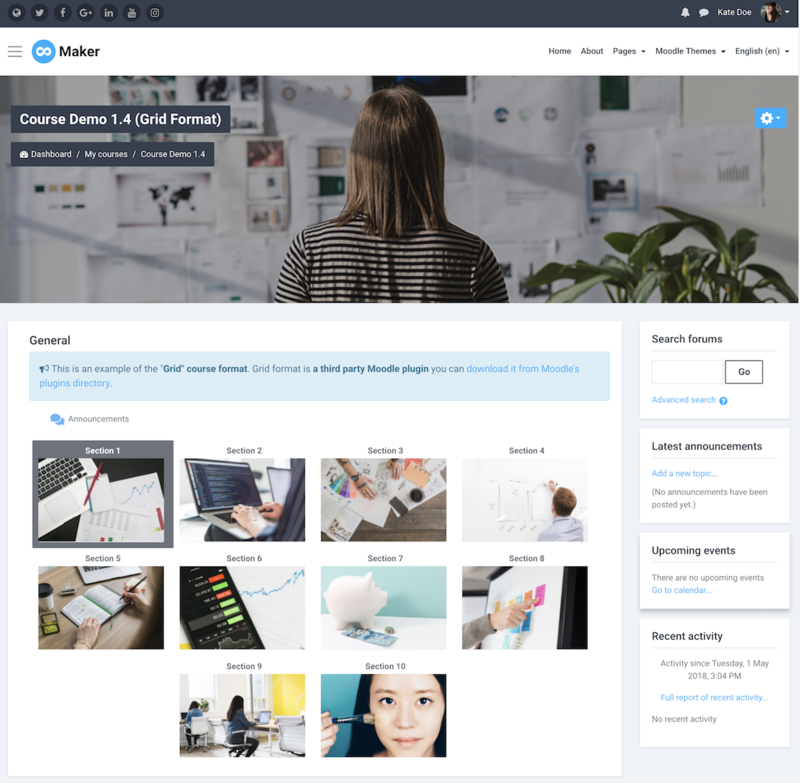 Unlike the rest of our Moodle themes, Maker is built based on Moodle’s latest core theme “Boost” which means it utilises all of the latest features available to Moodle and provides the best overall user experience for your Moodle site. It’s packed with awesome configurable features to work with your branding and will make your Moodle site truly outstanding. 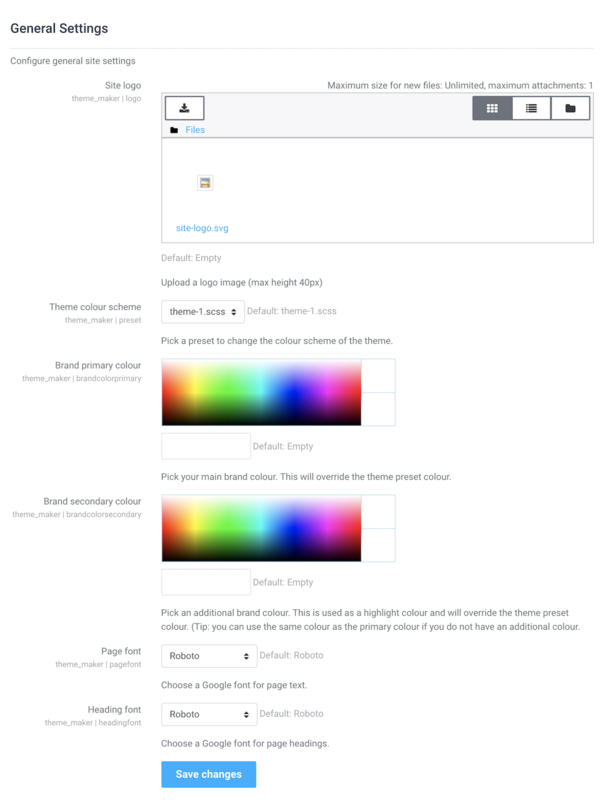 You can upload your own logo image, select your branding colours and Google fonts. 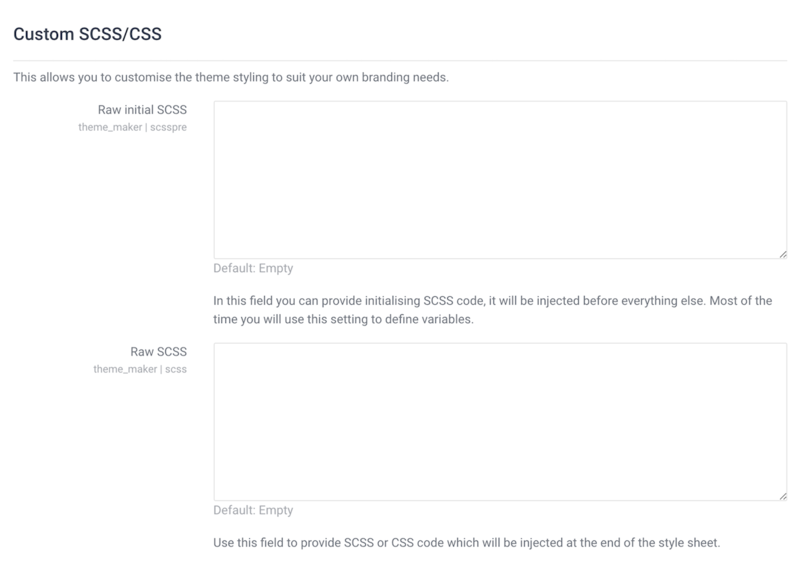 For advanced users, you can also add your custom CSS/SCSS to override the default theme styling. 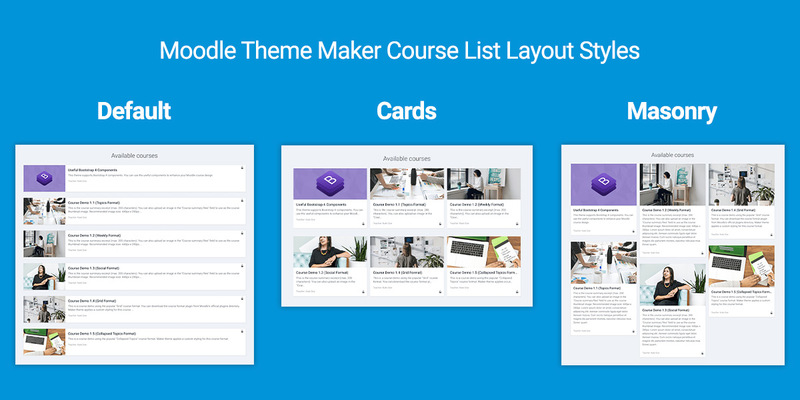 There are 8 configurable theme sections you can use to design your Moodle’s frontpage. All of the sections can be turned on or off based on your needs. In this section, you can add up to 4 slide images and a course search box. 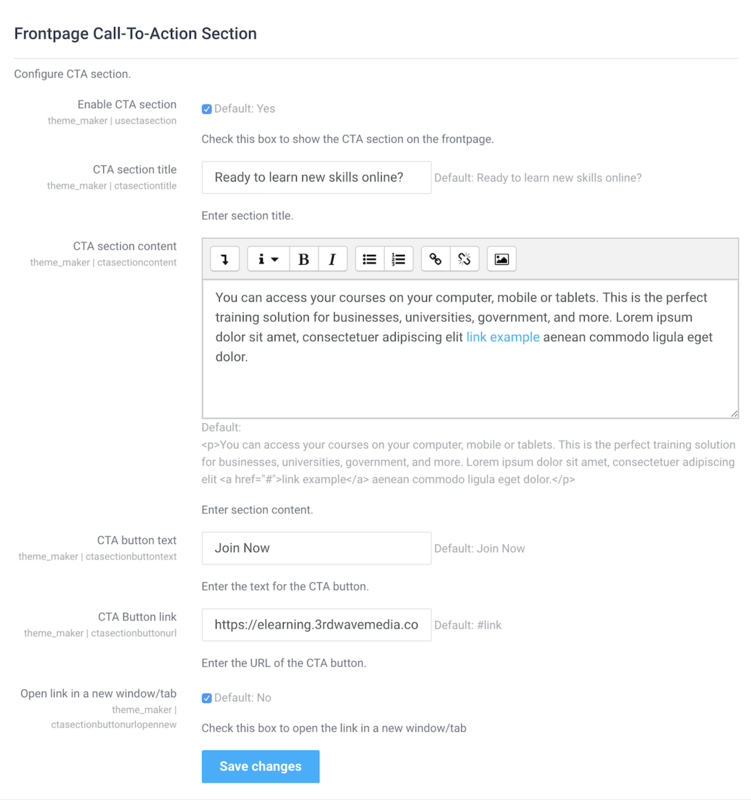 You can also add your site headline, summary, call-to-action button and a video link. If you want to make the slideshow section occupy less or more screen space you can adjust the height accordingly. In this section, you can add up to 6 blocks. 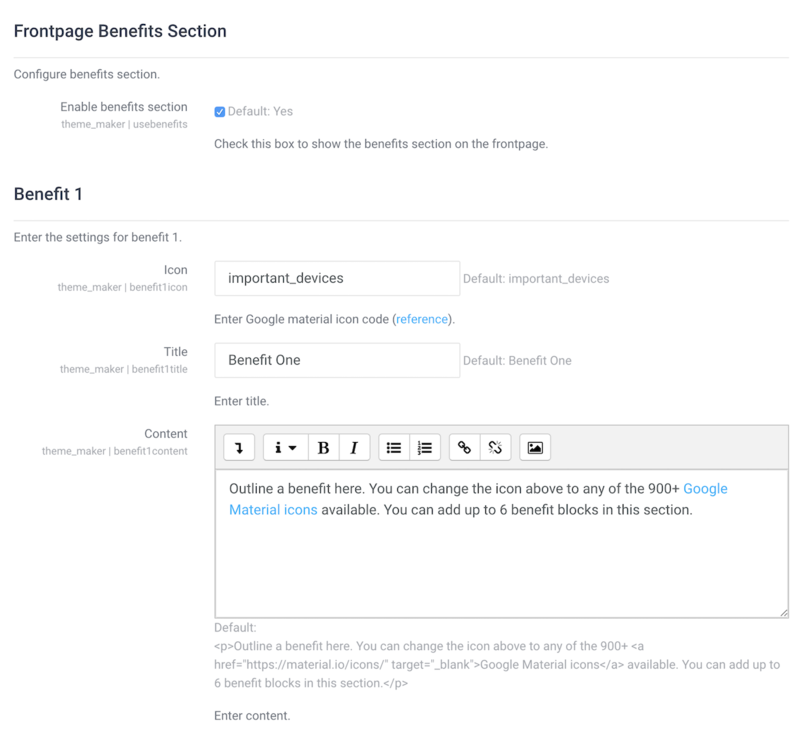 This section is designed for you to list benefits/features you offer to your users to convince them why they should take your courses. There are 900+ Google material icons available for you to use. This section is designed for you to promote your top courses/pages. 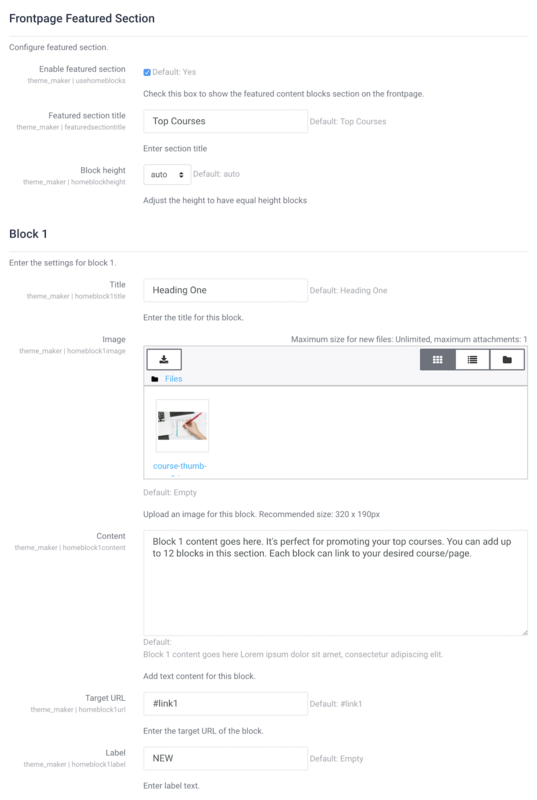 You can add up to 12 blocks and customise the thumbnail image, title, content and link for each block. If you’d like to draw visitors’ attention to a particular course/page item you can add a label on top of the thumbnail image. You can add up to 6 items in this section. 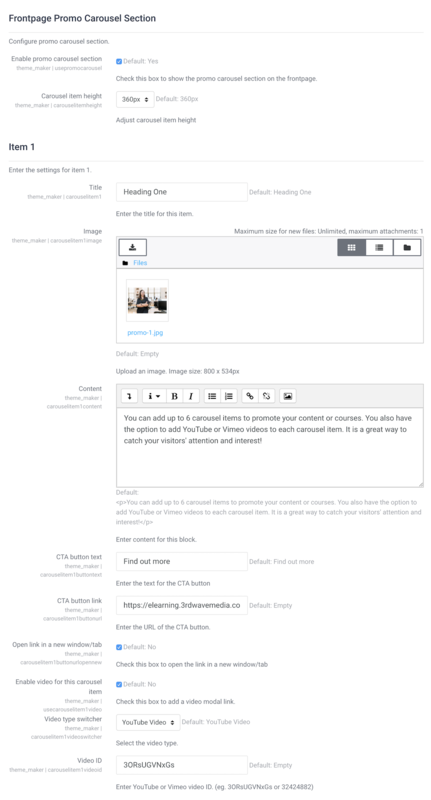 It’s designed as a content marketing tool. If you have some promotional Youtube/Vimeo videos, this is the perfect place to add them. You can use this section to display your users/awards/press mentions/partnerships etc. You can add up to 6 logo images. If you don’t want to use this section, you can simply turn it off. 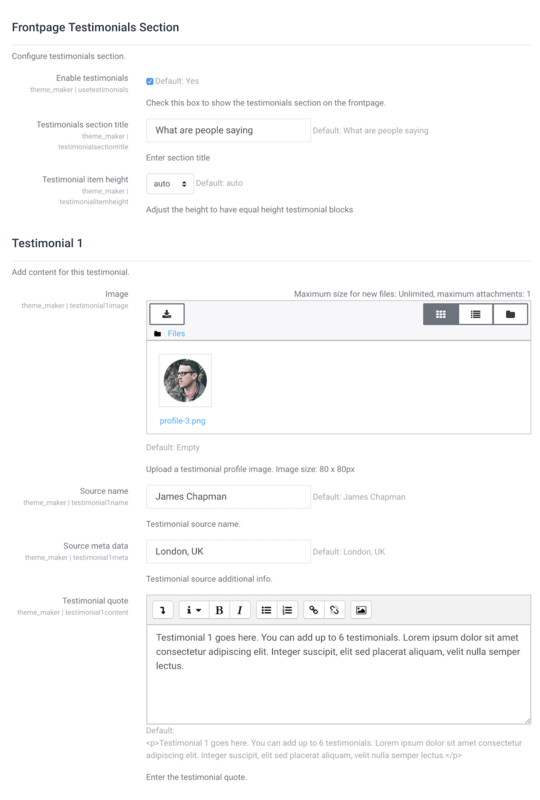 You can use this section to add up to 6 testimonials. It’s a great way to add social proof to your site. You can use this section to address frequently asked questions about your courses, business or organisation. It’s a great way to earn users’ trust by providing extra info about your learning platform or business model. You can add up to 10 Q&A in this section. 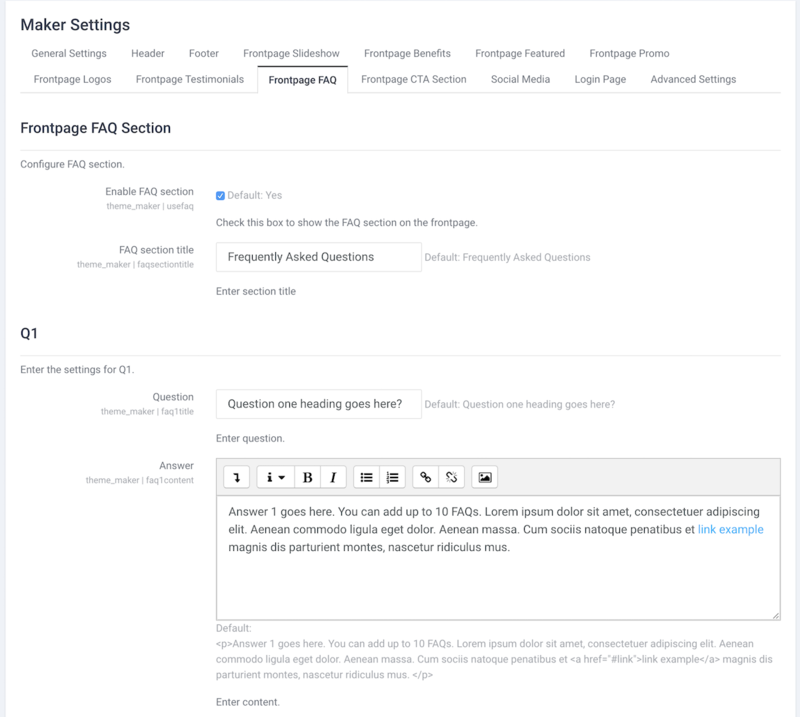 If you have more Q&A you can add them in a Moodle Static Page and provide a link from the frontpage FAQ section as shown on our demo. This section is just above the site footer. You can use this section to further promote your site and persuade users to take actions. 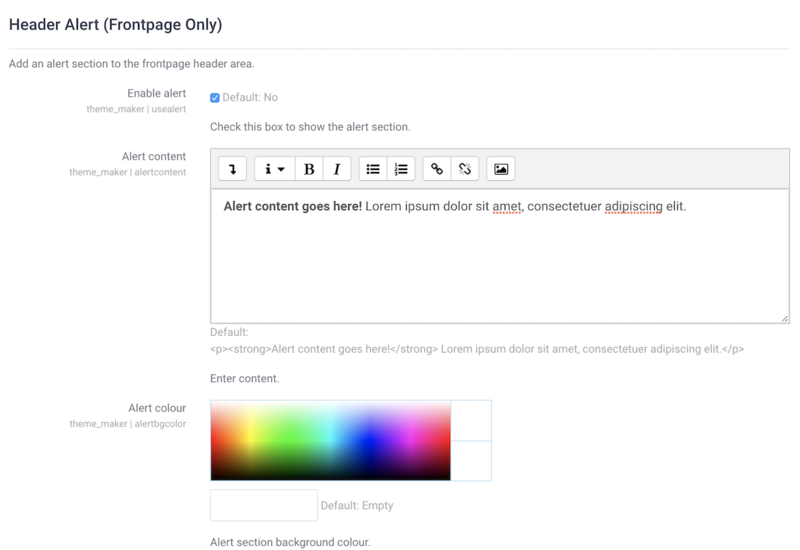 You have an option to add a site alert to the frontpage. It’s located just above the slideshow section. This can be very useful when you need to announce something new to your visitors for a short period of time. You can change the alert background colour to suit your brand colour. 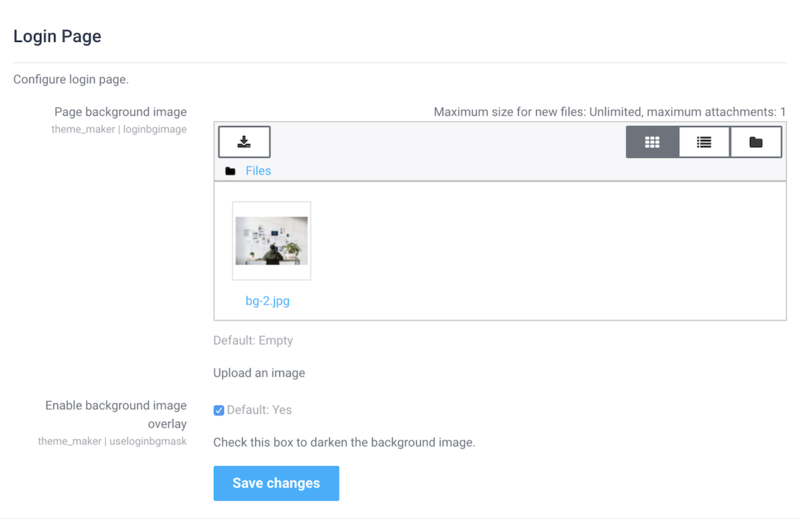 You have the option to add a background image to the login page. 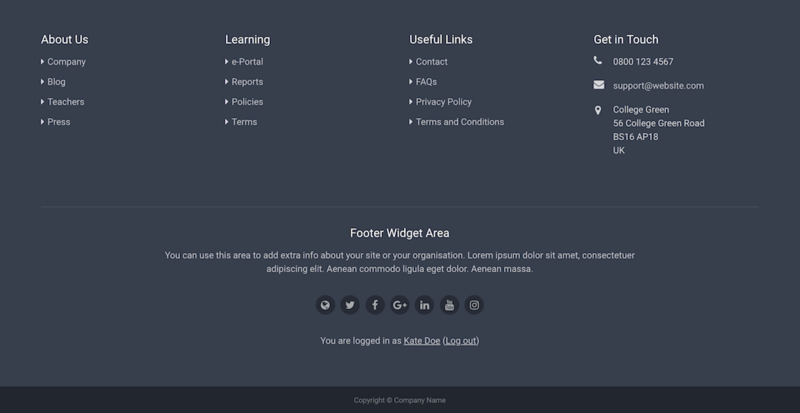 You can choose to display your social media links on the site header and footer area. 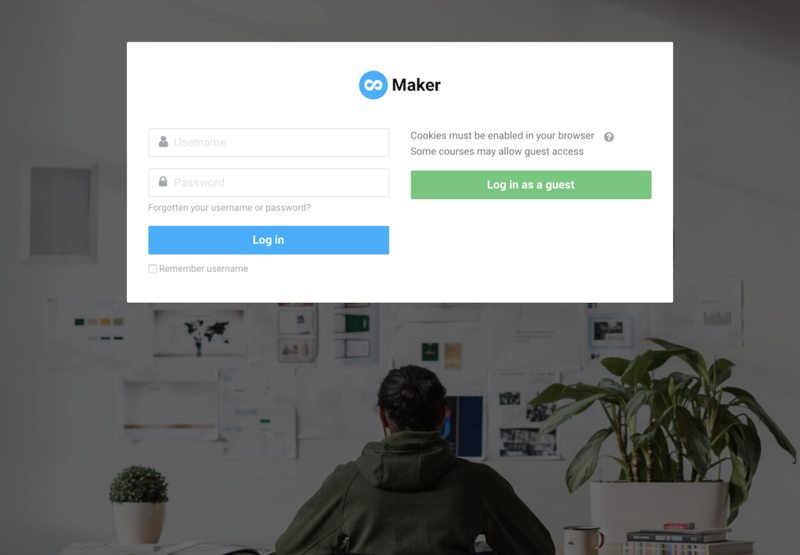 Maker has all of the major social media options built-in. Website, Twitter, Facebook, Google+, Linkedin, YouTube, Vimeo, Instagram, Pinterest, Flickr, Tumblr, SlideShare, Skype, Weibo, RSS Feed. 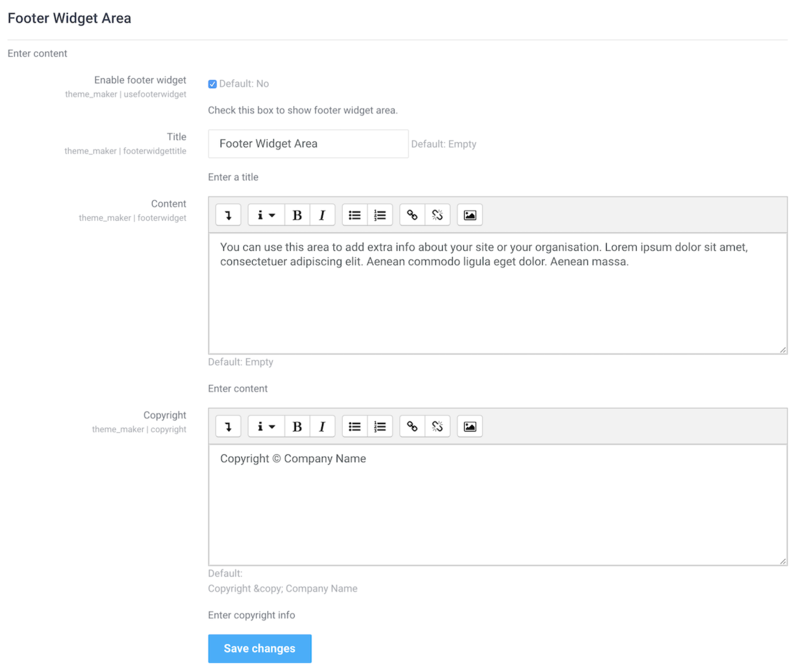 In the footer area, you have the option to add 4 content blocks (read the tutorial), 1 footer widget area and your site copyright info. You can monitor your site traffic by adding your Google Analytics ID.